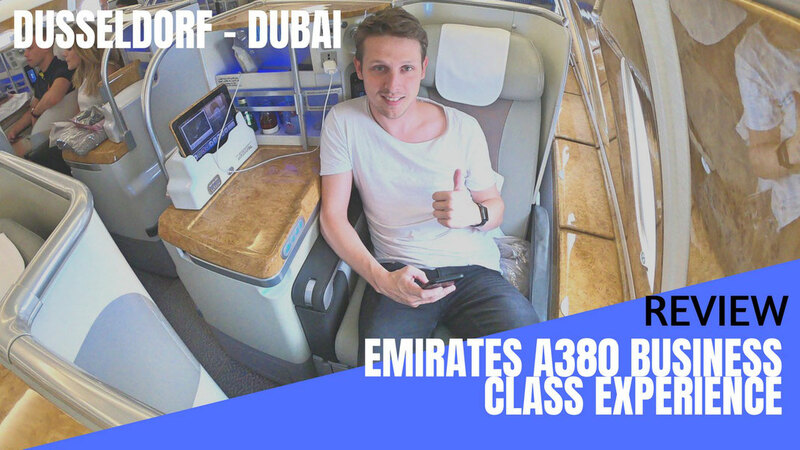 If you don't want to read the review (I know, too many words) you can just lean back and enjoy my video report which gives you a detailed inside of what it's like to travel on Emirates Business Class and experience their lounge. 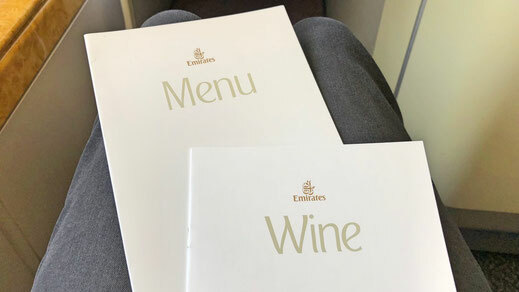 Emirates Business Class is located on the upper deck of the Airbus A380 between the bar at the rear end and the First Class Cabin. It features 76 flat bed seats in a 1-2-1 configuration. 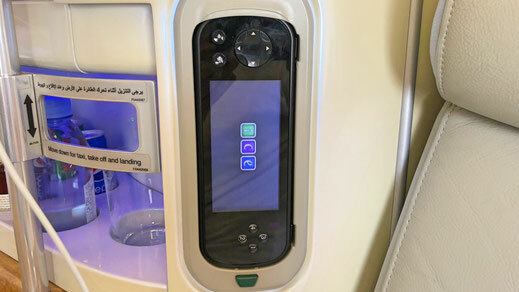 Each seat offers a personal entertainment screen, power outlet, USB-slots, a personal tablet and a mini bar. 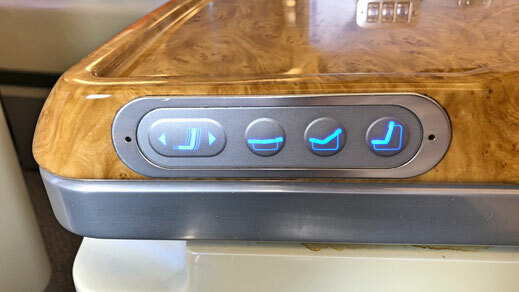 The seat also comes with additional storage if you happen to be seated at one of the window seats. 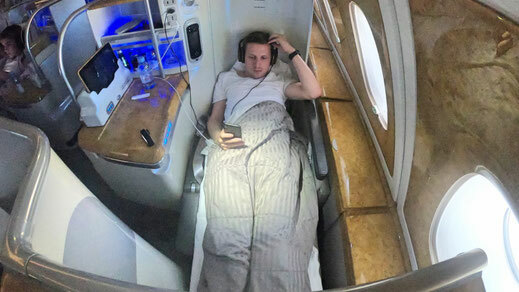 The product is great, however it's not as luxurious as Qatar Airways QSuite or Etihad's new Business Class on their Boeing 787. 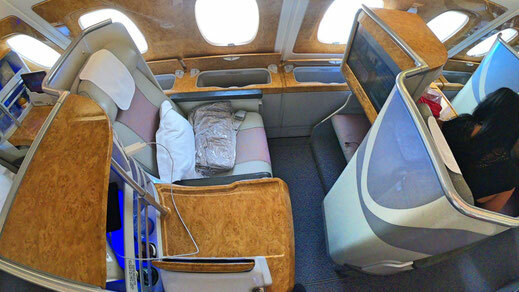 Find your best seat on Emirates seat on the Airbus A380 here. 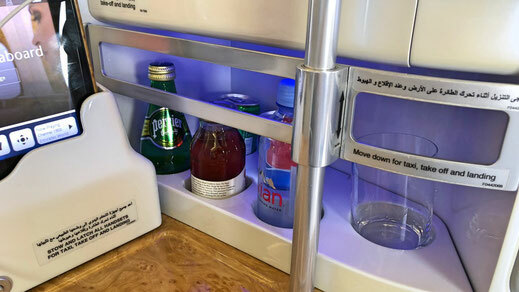 The 2 most iconic features about Emirates Business Class are the Mini Bar setup and their Award Winning Entertainment system which offers thousands of entertainment options. 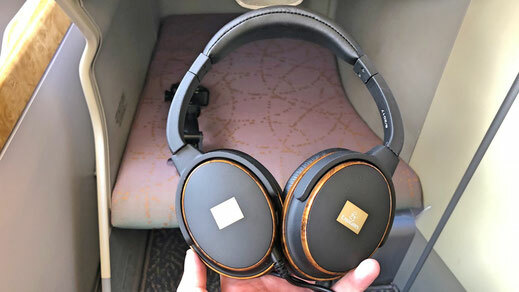 The noise-cancelling headphones are one of the best within the industry and I always have the feeling that the sound quality is the best on Emirates. What I also like about the seat is the amount of storage room. 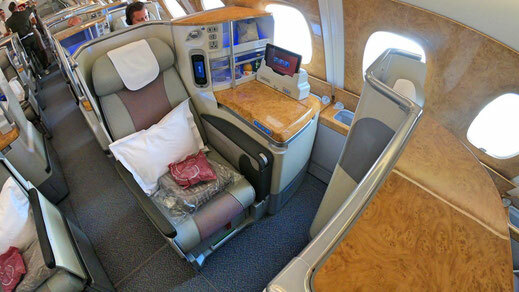 You have two big compartments between the windows and your seat. You'll only get that on an Airbus A380. 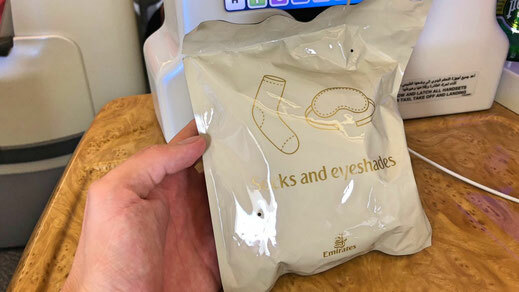 Emirates doesn't provide amenity kits on daylight flights, instead the provide you with socks and eyeshades but no earplugs which I find kinda stupid. They only give them out if you ask for them. I guess it's part of their effort to cut costs. 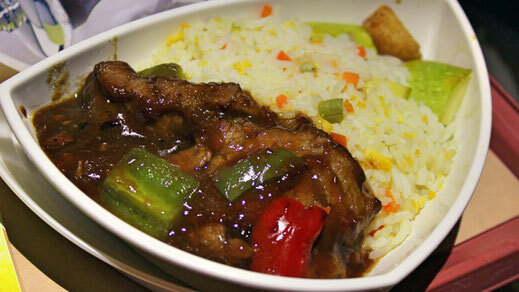 On this particular flight from Dusseldorf to Dubai only lunch was served. 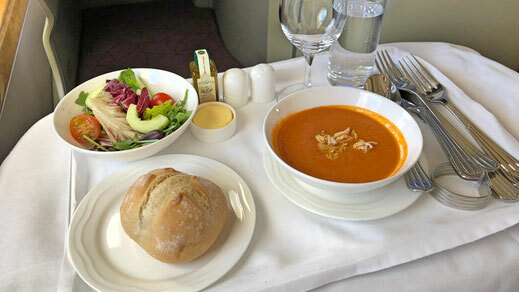 As a starter I had the Roasted Tomato Soup with coconut cream and chicken, which was super delicious. 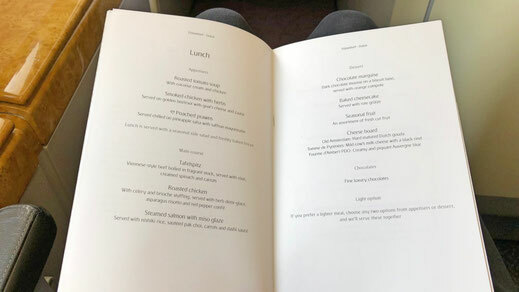 For the main course, Emirates offered a Tafelspitz, Roasted Chicken and Steamed Salmon. I went for the Salmon dish which was great! The service during lunch service was really good and efficient. I decided to skip dessert but they had a few options on display too. 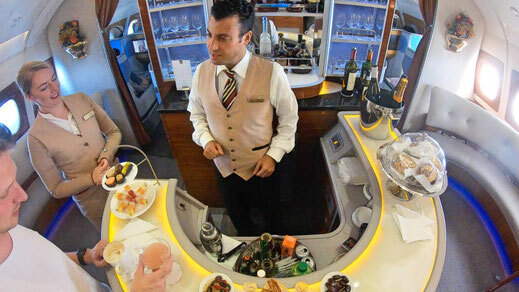 Accessible to all Business and First Class travellers, you can find the bar in the rear end of the upper deck. It's a great place to make new friends and they offer over 10 different cocktails. The bar was designed to accomodate up to 25 passenger and if you ask really nice they will let you take a photo with you standing behind the bar. You can also get snacks and food at the bar and of course everything is included in your fare! 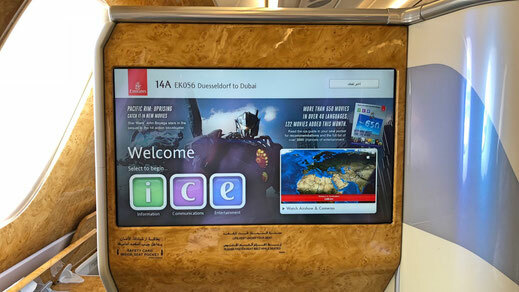 Emirates Business Class is probably the least glamorous in comparison to the other Middle Eastern carriers such as Qatar Airways, Etihad or Oman Air. However it is an absolute quality product. With the crew you gotta be lucky though, sometimes you have amazing staff and your next flight can be a total let down. 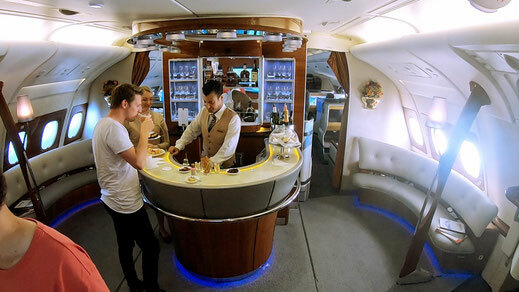 Overall I loved this flight though and especially the bar experience is what gets me smile all the time. 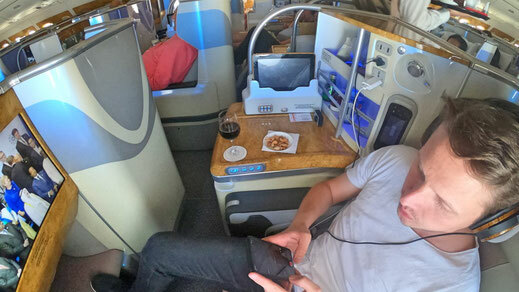 The seat is great and the lounge experience is always spot on!